This year I participated for the first time in the Book Blogger Holiday Swap. I had a great time shopping for my designated blogger and I received my gifts on Saturday! 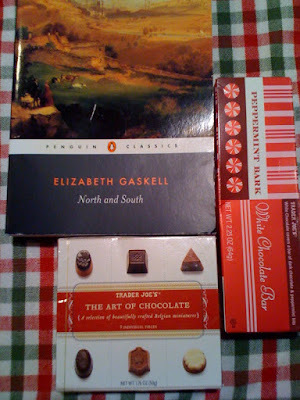 I was given a copy of North and South by Elizabeth Gaskell and some delicious chocolates from Trader Joe's. I've already started in on the mini Belgian chocolates and can't wait to try the peppermint bark (which I've been craving!). Many, many thanks to Joella (who I believe belongs to this blog -- she didn't say but I did some searching!) for the awesome and thoughtful gifts! They are exactly what I wanted! Side note: I love Penguin book covers. what a thoughtful Santa you have! all of that talk of chocolate... mmmm! One of my fav books that. I love Margaret Hale. I also love chocolate - lucky you! Enjoy! What a great Secret Santa present! And I read the same edition of North and South last month. :) Read it before you watch the miniseries!!! Yum! I love Secret Santa - kudos to yours!